Chosen Foods Soy Ginger Dressing .The Freezing/chilling Temperatures is Ambient: Room Temperature . Made of good quality ingredient . AUTHENTIC ASIAN flavors and aromas: Made with wholesome ingredients, our Tamari Ginger dressing is fragrant and savory with a hint of warm heat. 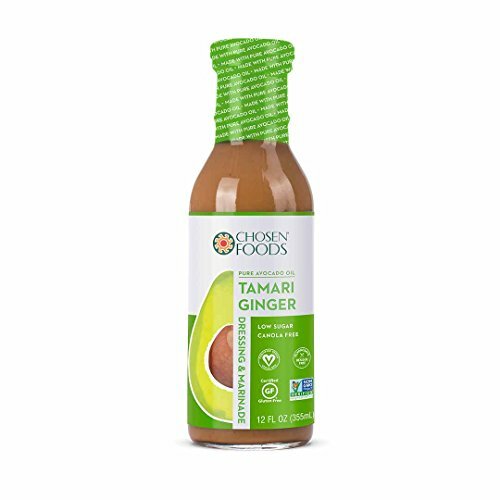 CHOSEN FOODS TAMARI GINGER DRESSING blends avocado oil, rice vinegar, organic cane sugar, soybeans, fresh ginger and sesame oil. HEART-HEALTHY FATS: Our avocado oil dressing contains the same cardioprotective fats found in olive oil. ALL NATURAL, NON-GMO and free from canola oil. OUR HASS AVOCADOS are harvested by farmers in our co-op groves and sorted for quality. If you have any questions about this product by Chosen Foods, contact us by completing and submitting the form below. If you are looking for a specif part number, please include it with your message. Primex Golden Flex Donut Fry Shortening, 50 Pound -- 1 each.